The yellow plum tomatoes were used to make yellow gazpacho. Of course, I had to go to the market to get a yellow bell pepper, a cucumber, cilantro and literally everything else necessary to make gazpacho, but the soup was really delicious. The mixed baby greens became a really yummy salad with sliced apples, walnuts, red onion and homemade honey-mustard dressing. The beets were thinly sliced and deep-fried to make chips and were served with a goat cheese/chive dip. Oh my, I am still dreaming about that dip. The Swiss chard was used in an impromptu dinner of shrimp and orzo all cooked separately then tossed together in a large saute pan with garlic butter. I don’t know what to call it, but it was super tasty. Last, but not least, the carrots and green bell peppers were used to make my Great-Grandma Hollingsworth’s carrot relish. Grandma used to always make this relish for big family meals and I always looked forward to it. It has a sweet and tangy dressing and is a great way to get kids to eat their vegetables. Here is the recipe (as well as a photo). I hope you’ll give it a try. Boil the carrots in salted water until they are tender-crisp. Drain and cool. In a medium saucepan, combine the tomato soup, oil, vinegar, sugar, mustard, Worcestershire sauce, salt and pepper. Heat until the sugar is completely dissolved and keep hot. In a large bowl, combine carrots, peppers and onions. Pour hot sauce all over, cover and marinate for 24 hours in the refrigerator. 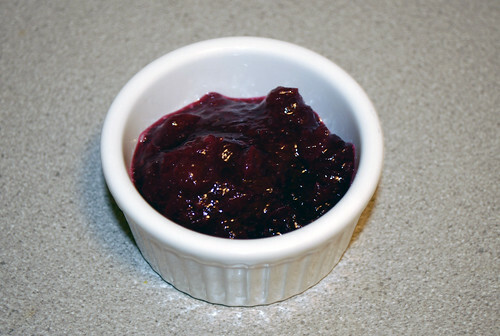 This relish will keep for up to 2 weeks in the refrigerator. Good Morning Provence! Actually, I’m still in NYC but I feel as though I’ve been in Provence this week with my awesome farm share! This has been my favorite box since we’ve started receiving our weekly deliveries. This week I made a deliciously cheesy potato and fennel gratin. I LOVE gratins and my husband and I absolutely flipped over this tasty dish. Luckily, I made enough so that we have leftovers for lunch! I served this gratin with some roasted chicken and the green beans that I pre-blanched then sauteed in olive oil with lots of garlic. This meal was a perfect Sunday family meal! The eggplants and zucchini became a wonderful ratatouille (see recipe below). This ratatouille is super versatile and can be eaten hot, cold or room temperature. I’ve used it in everything from omelettes to a side dish for pan-seared sea scallops. I used one of the cucumbers in a salad with the mixed baby greens and I used the rest of the cucumbers in a great raita. Okay, so I left Provence for India. It was a very flavorful journey! I served the raita with curried lamb burgers in flatbread. This dish was super easy, really yummy and a great summer night dinner. Last, but not least, the fava beans are going to be used in tonight’s dinner. I will most likely saute them with some butter and garlic and enjoy them with a pan roasted salmon filet. Wow, I’m hungry for dinner already! Heat oil in a large heavy bottomed pot over medium-high heat. Add onion and saute until nearly tender. Add garlic and saute 1 minute. Add zucchini, eggplant and pepper and saute until tender-crisp. Add diced tomatoes, tomato paste and anchovy paste and stir to combine well. 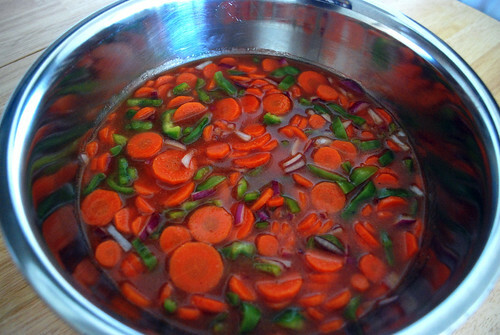 Cover, lower heat and let simmer until vegetables are nearly tender. Remove from heat and add fresh herbs, stirring to combine well. Let sit for 1 hour to let flavors meld. Season with salt and pepper to taste. The Napa cabbage became pork pot stickers served with my favorite dumpling sauce (soy sauce, rice wine vinegar and sesame oil); the scallions were in everything from the afore mentioned pot stickers to tangy buttermilk-scallion mashed potatoes; the red Russian kale went into a hearty and colorful Tuscan white bean soup (feel free to email me for the recipe); the green leaf lettuce – salad with Maytag blue cheese dressing; the basil went into homemade marinara sauce and onto Margherita pizza; the mixed baby greens – salad with a sweet port wine vinaigrette; last, but not least, the Italian parsley was in everything, adding fresh herbal notes to everything it graced. It was a fun, delicious week and we are looking forward to tomorrow morning’s delivery… Stay tuned! The other night my husband and I got together with our friend Sophie to make some sweet treats for a friend who has been under the weather. This friend of ours is such a wonderful person who is always volunteering to help others and is well known for baking cookies to send to the troops overseas that we felt it was only appropriate to make some sweets for the lady who is always making treats for others. To that end, Sophie made beautiful strawberry jam, I made a blueberry crumble pie and my husband served as the best sous chef we could have ever hoped for. For all the love that went into making these antioxidant rich, vitamin-packed fruity treats, I’m sure our good friend will be on the mend in no time! It’s been a busy week getting all of the Farm Share vegetables eaten in time for the next delivery tomorrow morning. I had a lot of fun and wanted to take a moment to tell you what I did with all of them. The red Russian kale was sauteed in olive oil and butter (I love butter!) with some of the garlic scapes. The Napa cabbage served double duty as it was so large… The first dish was a cold salad of thinly sliced Napa cabbage, radishes and garlic scapes simply dressed with rice wine vinegar, sesame oil, salt and black pepper. The second dish was a saute of Napa cabbage and onions in olive oil and butter (! ), seasoned with salt and black pepper. The garlic scapes found their way into everything I could manage and I still have 5 scapes left! The mixed greens were used as a salad with radishes and garlic scapes dressed with homemade honey-mustard dressing. The bok choy was steamed and dressed with soy sauce, rice wine vinegar and sesame oil. The romaine lettuce was used for chicken (for my husband) and shrimp (for me) Caesar salads. We had a lot of fun working with these vegetables and felt good about helping out our local farmers. Stay tuned to see what we receive tomorrow morning!